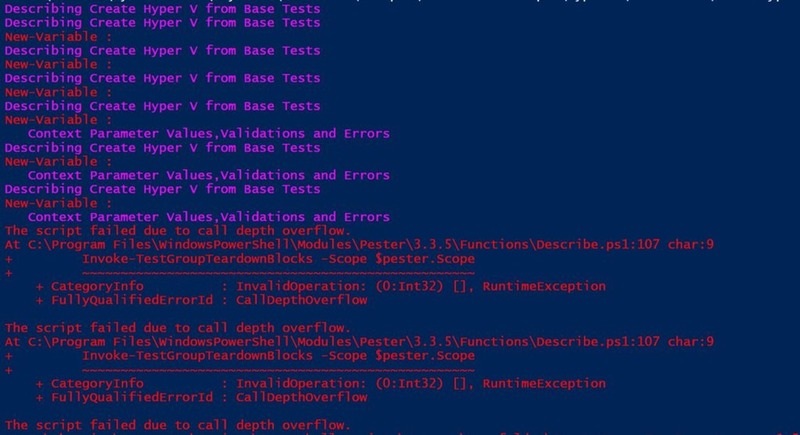 PowerShell Pester – "The script failed due to call depth overflow." This error caught me out. I am putting this post here firstly to remind me if I do it again and also to help others who may hit the same issue. So I created a function script file Create-HyperVFromBase.ps1 and a tests script file Create-HyperVFromBase.tests.ps1 as shown. .Replace() is case sensitive. It didn’t remove the .tests. keyword from your file name. So it calls your test script again and repeats the same mistake over and over. Don’t forget to name your Pester Tests scripts with a capital T when loading the script in this way and remember that Replace() is case sensitive. This entry was posted in PowerShell and tagged error, Pester, Powershell. Bookmark the permalink.